Only 16 of the group of 130 Europeans were permitted to enter, leaving trucks laden with wheelchairs, medicines and a dialysis machine stuck at the border. UN agencies say the Gaza blockade appeared to have been tightened in recent months. Separately, a desert marathon runner was also denied access to the Strip. The Hope for Gaza convoy, organised by a range of small, Europe-based humanitarian organisations and other groups, had travelled from Milan over the past month. Its UK-based coordinator, Rami Abdu, claimed the Egyptian authorities had said they would be allowed access and had even stamped the whole group\’s passports to allow them to exit Egypt. But they were told \”high instructions had… suddenly\” been received and only 16 of the convoy participants would be allowed to enter, he said. It is the latest of several attempts by activists and NGOs to break the blockade. Previously groups have brought ships into Gaza by sea. Mr Abdu said the aid deliveries were co-ordinated with hospitals and rehabilitation centres in Gaza, some of which were private, some run by the Hamas administration. Under Israel and Egypt\’s joint blockade of the strip, little more than humanitarian basics are allowed in. International organisations say the Israeli authorities have tightened restrictions, after the flow of aid increased in the wake of Israel\’s military operation in January. 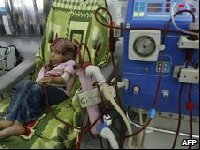 \”These restrictions have again become severe and excessive,\” said Tony Laurance, acting Head of World Health Organization in the West Bank and Gaza Strip. Although medicines and medical equipment do enter Gaza, the process of getting permission for many items is \”slow and cumbersome\”, he said. The WHO said that, as of mid-May, stocks were short of 82 different drugs, with less than a month\’s supply left. Mr Laurance said there had been problems ensuring that medical donations matched needs, and inappropriate or out-of-date medicines having to be destroyed. At the weekend, the UN relief agency Unrwa said the blockade was intensifying the deteriorating health situation in Gaza. Unrwa said the number of different \”essential\” items allowed into Gaza had gone down from 4,000 before the Israeli military operation in January to about 40. A spokesman for the Israeli Defence Ministry disputed the claim and said the policy had not changed. He said there was no list of banned items, but \”luxury items\” and items which could be used for military purposes were still restricted. The blockade was tightened after Hamas seized control of Gaza in June 2007 and in response to rocket fire into Israel. The spokesman said militants were still firing rockets into Israel and there had been no movement on the release of the captured Israeli soldier Gilad Shalit. Separately, Italian marathon runner Max Calderan, was denied access from Israel into Gaza. He had been planning a Run for Love covering 335 miles (540km) from Ramallah in the West Bank to Jerusalem, through Gaza to the summit of Egypt\’s Mount Sinai. Unrwa, which had been due to provide security for the Gaza leg, said the Israeli authorities had told him they would let him in. The Defence Ministry spokesman said he was unaware of Mr Calderan\’s request for permission until he arrived at the crossing.